This discipline requires extreme accuracy and is shot from a sitting position, with a precision rifle resting on a front stand located on a bench or table. On top of the rifle is a scope giving far higher magnification than traditional rifle sights - up to 45x. For some competitions the rear of the rifle rests on a sandbag; for others the rifle is placed into the shoulder. Because of this, it is a suitable discipline for many disabled members as they can compete on an equal basis to able-bodied shooters. Our Club concentrates on all categories of live round benchrest shooting (which relate to the weight of the rifle): .22 Heavy Varmint /Unlimited (13.5lb), Sporter and.22 Light Varmint (10.5lb). Distances shot are 50m outdoor and 25m indoor. 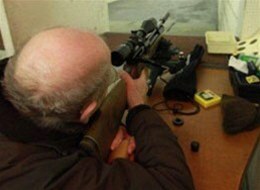 We also shoot airgun benchrest which is a growing discipline for our Club. For both indoor and outdoor competitions the cards vary from 10 targets to 25 targets per detail. We take part in postal competitions through our affiliations with Cumbria and Northumberland Target Shooting Association and UKBR22. The Club teams also enter national and international competitions, several of which we host in Portishead. Because precision is so important for this discipline rifles can cost several thousand pounds to buy new. People often choose to have these custom built. Scopes also vary in price from a couple of hundred pounds to over a thousand - two of the most popular being Falcon and Leupold. There are a number of rest manufacturers, one being Caldwell, with products starting from around £50. (For a product review, please see here).